Iceland has announced a new government that will be headed by the modern world's first openly gay leader. Johanna Sigurdardottir was named new prime minister by the country's coalition political parties. Iceland's previous coalition cabinet of PM Geir Haarde collapsed last month under the strain of an escalating economic crisis. Ms Sigurdardottir's government said on Sunday it would immediately start to tackle Iceland's crisis. "The government inherits enormous difficulties due to the banking and systemic collapse as well as considerable and rapidly increasing foreign debts and liabilities of the national economy," the new coalition said in a statement. It said its priorities would be replacing the board of governors of the central bank and to ask a parliamentary committee to look at the possibility of entering the European Union. Ms Sigurdardottir, a former social affairs minister, is the member of the Social Democratic Alliance. The 66-year-old's appointment as interim leader - until elections in May - is seen by many as a milestone for the gay and lesbian movement, correspondents say. "I don't think her sexual orientation matters. Our voters are pretty liberal, they don't care about any of that," Skuli Helgeson, Social Democratic Alliance's general secretary, told the BBC. Ms Sigurdardottir - who has never hidden her sexuality - is, nevertheless, very private about her personal life, never discussing it in public. She married her companion, Jonina Ledsdottir, in 2002. Ms Sigurdardottir is one of Iceland's most popular politicians. Her appeal has held up even as confidence in the government itself has plummeted, amid the economic crash, soaring unemployment and street protests. Born in the capital Reykjavik in 1942, Ms Sigurdardottir studied commerce before becoming a flight attendant for Loftleidir Airlines in 1962. After nine years at the airline, during which time she began a parallel career as a union organiser, she left and got an office job at a packaging firm in the capital. Ms Sigurdardottir was first elected to Iceland's parliament in 1978 and was given her first ministerial office - social affairs - in 1987. 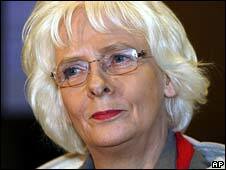 In 1994, she left government and unsuccessfully stood for the leadership of the Social Democratic Party. She then formed her own party, the National Movement, which won four parliamentary seats in the next year's general election. The party later merged with the Social Democratic Party and two other centre-left groups to form the Social Democratic Alliance (SDA), which they hoped would counter the dominance of the right-wing Independence Party. It was not until after the 2007 election, however, that the SDA got a chance to govern, albeit in a left-right coalition with the Independence Party.